Designed and produced in association with Mitsibushi, the Geolander G033 has been approved as original and replacement equipment on one of the Mistibushi's flagship 4x4's the Mitsibushi Shogun. 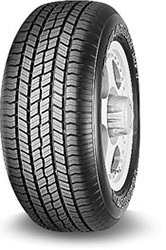 Part of the Geolander range of 4x4 tyres, the Yokohama G033 is designed to offer comfort expected of a passenger car tyre whilst providing the handling and perfomance characteristics associated with a larger, heavier and more traditional 4x4 tyre. A great 4x4 tyre for any vehilce, with optimised perfomance when fitted on certain Mitsibushi Shoguns.